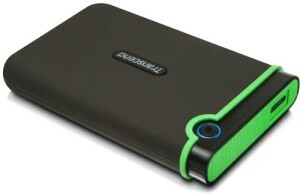 Featuring blazing fast transfer rates, huge storage capacities and a 3-layer shock protection system, the StoreJet 25M3 USB 3.0 portable hard drive is an ideal storage device for everyday back-up, storage, and file transport. The StoreJet 25M3 portable hard drive is equipped with SuperSpeed USB 3.0 interface that provides transfer speeds at least 3x faster than USB 2.0 models. Thanks to the improved bandwidth of USB 3.0, the StoreJet 25M3 makes file sharing easy and quick with transfer speeds of up to 90MB/s. Compact, durable and reliable, the StoreJet 25M3 is shielded by an advanced 3-stage shock protection system to withstand even the toughest environment. 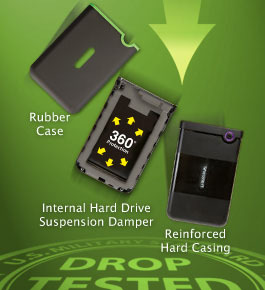 The outer shell is made of a slip-resistant silicone material, reinforced by a hard casing and an internal hard drive suspension damper — all designed to reduce forces of impact and provide maximum shock-absorption. Available in a wide range of capacities, the StoreJet 25M3 can carry your entire collection of movies, music, documents, eBooks, and photos — all in the palm of your hand. Each 1TB drive can store up to 168 hours of 1080p High-Definition footage, more than 16,000 hours of digital music, or 480,000+ high resolution digital images. Using the StoreJet 25M3 on your computer is easy. Simply connect the drive to a SuperSpeed USB 3.0 port and drag and drop desired files to and from the device. The StoreJet 25M3 supports Microsoft Windows 8/7/Vista/XP, Mac OS X, and Linux systems, and is backwards compatible with USB 2.0 ports. 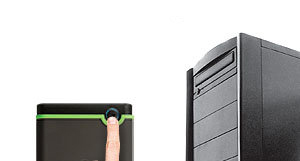 Instantly back-up your data with one touch. For added value, the StoreJet 25M3 includes the Transcend Elite data management tools that help you manage data and increase productivity. With this convenient software, you can easily perform incremental back-ups, compress files with 256-bit AES Encryption, and use the hard drive as a digital lock for your computer. The StoreJet 25M3 is equipped with an extremely convenient One Touch auto-back-up button for instant data back-up and synchronisation when used with Transcend Elite software. 1Based on file size 2MB. 2 Based on 4min per song, 128Kbps quality. 3 Based on 2.25GB per hour DVD quality.